Denver native Kim Allen who grew up in Harvey Park is most well known for his photographs of Denver from the 80s and early 90s where he documented the Mile High City at a unique time in its history with the use of his camera. What makes these pictures distinctive is Allen had the foresight to capture areas of downtown Denver that were decayed, but were on the cusp of a renaissance. 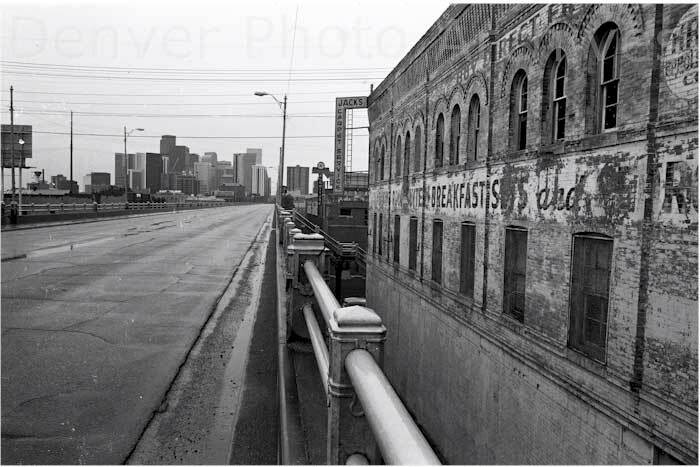 He captured photos of the viaducts just before they were torn down, the area where Coors Filed was built, and a desolate and deteriorated LoDo was visually chronicled before any trendy bar or exorbitantly priced lofts could be found. Allen’s photographic adventure of Denver has created a comprehensive review of a city that was on the brink a major metamorphosis. 16th Street looking northeast down Wazee Street in 1988. Copyright Kim Allen / Denver Photo Archives. Kim’s photos are showcased at Denverphotoarchives.com. The Denver Photo Archives was created to feature Allen’s work. His photos are also found on the website buckfifty.org which includes engaging articles and works from several contributing Denver writers and artists. Denver Urban Review had the privilege to learn more about Allen’s photographs and captured his thoughts on Denver. DUR: How did your youth shape your photography? Kim Allen: My youth was unstructured. I do remember an elementary school visit to the City and County Building, our class was asked to draw about it… I distinctly remember a pencil drawing I did of the front of the building I was very proud of, an early conception of composition. DUR: Was photography something you were passionate about as a youngster or was it something you discovered later? Kim Allen: Photography was not on my radar as a youth, sports was king… then discovering girls and beer replaced sports. DUR: How did your interest in photography evolve? Was it something you fell in love with right away, or was it something you gradually developed an interest for? Kim Allen: As a teenager I traveled alone many-many times by bus to visit cousins in Lake Tahoe. I started collecting postcards and was enthralled by wanderlust and postcards that celebrated travel. After high school I moved to Vail, I traveled as well by bus and hitch hiking mostly in the west. . . I started taking images of my trips with my little instamatic camera, I was hooked – I could not wait to see my photos! 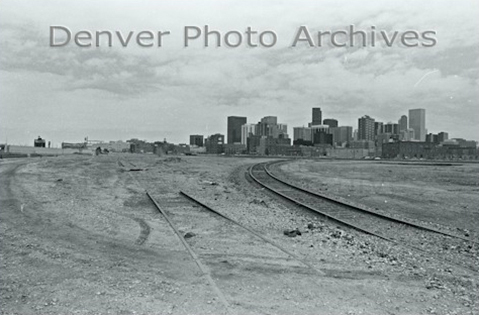 DUR: The photos featured on the Denver Photo Archives website– the idea to capture Denver and specifically LoDo just before all the redevelopment took place, was that the result of one epiphany or was there a build up and a combination of several ideas that coalesced to create this work? Kim Allen: I had lived in Vail and Telluride for a total of 10 years after high school. I thought I would spend the rest of my life in the mountains… basically the adventure dulled. I was essentially a lower/middle class kid that as time went by realized I loved and felt more comfortable in Denver. I noticed various renovation projects in Denver and started to photograph them, I became hooked on documenting Denver as artistically as possible. Once again, I was hooked! I studied books of photographer’s L. C. McClure, J.E. Stimson and David Plowden and realized the respect I had for such important work as chronicle of our historical heritage. DUR: Why do you think you were really the only one that recognized that this moment in Denver’s history needed to be documented? Kim Allen: I would love to take full credit for being the only person to photograph in a similar vein at that time. A gentleman named Roger Whitacre did some work related to his real estate clients. Some of his work was seen in Historic Denver publications, he is a drawer and done small sculpture’s as well. Roger is a very talented man, I consider him a friend. I developed my own style of climbing R.R. tower’s, climbing buildings, climbing viaduct infrastructure’s etc. – My goal was to take an image that was absolutely killer! I walked and walked, climbed and climbed. I took an image fueled by childhood adventure and honed into an uncommon view from my tenacity to capture a powerful iconic image! I researched subject matter, called people, talked to people… I knew exactly what was going on, “if a board had moved” from one month to another… I had become Denver. My composition became better, each photo, each roll of film confirmed my dedication was producing excellent photographs. My own style was created, I wanted to be better than any photographer Denver had ever seen, period! DUR: Do you see yourself as an artist or documentarian? Kim Allen: Documentation and art can overlap each other… I tried to combine both intensions. I artistically wanted my images to be great, the documentation was simply the determination to continue part of Denver’s story. I hung around with some artist’s (painters) and some photographers… it really was not my gig. I actually was shocked that none of them seemed to understand what was occurring, even the photo staff’s of two major newspapers in Denver did not recognize the phenomena that had started. DUR: During the time of the Denver Photo Archive images were captured, were you working as a full-time photographer? If not, what was your day job? Kim Allen: I started out wanting to be an assistant commercial photographer or a newspaper/magazine photographer. I really had no clue of the actually reality of each profession. I really did not fit into either profession and discovered early on I had a different calling… I was a loner determined to create special work. I worked construction jobs of painting to pay rent, buy my film and beer to celebrate. DUR: When you were down in the LoDo area taking photos, was it pretty easy to walk around and take photos, or were you always looking over your shoulder? Kim Allen: I would have devoted more time to other areas of Denver, the action just was not there. 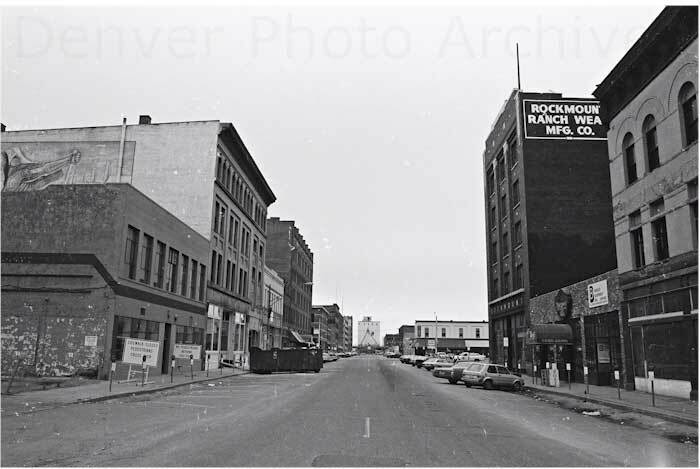 I followed the money… when Dana Crawford, Mickey Zeppelin, Larry Nelson, Jerry Glick and others were starting LoDo projects I knew the city was about to change Lower downtown/ Platte valley was very expansive. I could walk forever never crossing a fence or major street because the viaducts carried most of the traffic… it was all fields, birds and rabbits. It is a huge misconception of downtown or lower downtown being dangerous, there was no one there. It is a myth that is was dangerous, a good story for my photos – but untrue. 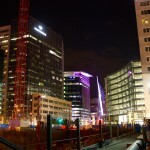 DUR: Did you continue to take photos of Denver through the 1990s and into the 2000s? If not, why did you stop? Kim Allen: Photographing Denver was an obsession, it had taken control over my life. I realized one day I seldom took images of my Mother or family members. The respect of my photo work had not matured, I liked beer too much, and a new relationship with my future wife, they all added up to putting my camera away in 1994. I put my negatives and camera in storage, never looked at them again until 2008. DUR: Over the last 25 years, has Denver progressed as you anticipated it would, or have you been surprised by how it is evolving? Kim Allen: I was absolutely certain Denver was going to bust out big time. I thought more would develop to the east side of Union Station. The vast Central Platte Valley took precedent… the deep financial pockets of Denver’s sport scene replaced the rail yards with Coors Field and Pepsi Center, and the gold rush was on…. Elitch Garden also relocated prior. 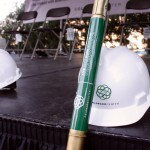 Many-many small projects had started prior in lower downtown, the transformation was already set. John Hickenlooper and fellow founders in 1988 of the Wynkoop Brewing Company. The perfect storm had started, the purchase of land behind Union Station by East-West Partners and also Continuum sealed the deal big time! DUR: With Denver’s current incredible growth, do you fear that Denver’s identity, its culture, and its built environment are headed in the wrong direction? Kim Allen: The market determines everything, supply and demand. My parents experienced a different Denver, I experience a different Denver, new residents are now experiencing their reality. I would however urge ALL residents to look deeper into the wonderful attributes of Denver other than the low hanging fruit of the dazzle of overpriced restaurants and cocktails that appear in the sewer system soon afterwards and the money gone… setting the bar a little low as a community in my opinion. DUR: Down the road in 50 years, how do you feel people will view the architecture of this current development cycle? Will people say that buildings were constructed that are not architectural significant? Kim Allen: Yes and no… a city is part of massive complex of components. You can not make everyone happy… developers, contractors, architects, planners, citizens all have their own role and agenda. Living in a perfect world of great architecture and construction etc. for small town prices is a thing of the past. There are pros and cons of everything, nothing in life is free, there is a price we all pay – the result of what we consider success. People who sit on the side line and complain about every design need to get a JOB in the field, then will realize their boss calls the shots – and the boss is told what to do – by his boss!